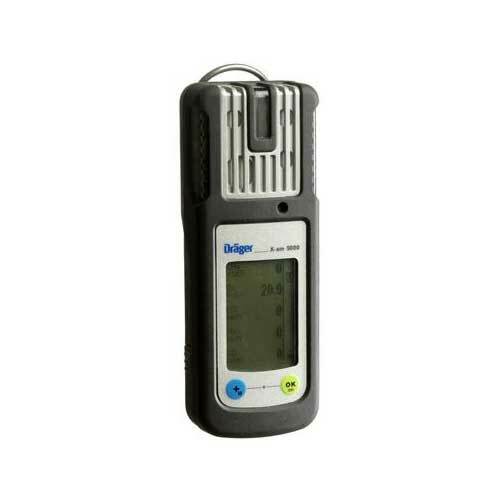 The Drager X-am 5000 is the smallest gas detector that is suitable for up to five gases. Part of a new generation of gas detectors, the X-am 5000 was designed especially for applications requiring personal monitoring. This 1 to 5-gas detector reliably measures combustible gases and vapours as well as oxygen and harmful concentrations of CO, H2S, CO2, Cl2, HCN, NH3, NO2, PH3 and SO2. An added advantage of the X-am 5000 is a variety of special calibrations for the catalytic Ex sensor allow even more sensitivity when detecting specific combustible gases and vapours. The X-am 5000 is also equipped with durable XXS sensor technology. The Drager X-am 5000's key feature is that it offers maximum security and extremely low operational costs. Ergonomic mobile phone design - Despite its advanced functionality, the Drager X-am 5000's practical, mobile phone design and light weight make it comfortable for users to carry. Reduced to its essentials, the two button control panel and easy to follow menu system allow for intuitive use. Durable electrochemical sensor technology - The longevity of the catalytic sensor and five year expected lifetime of the oxygen sensor are unique in the market. The Drager X-am 5000 is equipped with the latest in the miniaturised XXS generation of high performance electrochemical DragerSensors. Flexible and adaptable sensor exchange - It is easy to exchange, upgrade or calibrate the sensors to other gases. The ability to customise the Drager X-am 5000's sensors makes more applications possible, including rental equipment. Innovate Ex sensor with full range - functionality The catalytic Ex sensor measures 0-100 % LEL and 0-100 Vol.- % methane concentration. The calibration concept simplifies a calibration to vapours. When set for maximum sensitivity, the detector is even more reliable to warn about unknown hazards. Robust and water-tight - The Drager X-am 5000 is tough: water and dust-resistant according to IP 67, the detector remains fully functional even after falling into water. The integrated rubber protection and shock-proof sensors ensure additional resistance to impact and vibration. Moreover, the Drager X-am 5000 is insensitive to electromagnetic interference. External pump - The optional external pump, which operates with a flexible hose up to 20 M long, makes it possible to use the detector for pre-entry measurements for tanks, shafts, etc. The pump starts automatically when the detector is inserted. A functional instrument must include up to 4 sensors and a power supply unit.